All right... I'm not very good at this, but the priest said it would help, so I'm gonna try. I say that I do the terrible things I do because I couldn't find who killed Sarah and Teddy. And that once I did, I'd be free of this darkness and this rage but I lied. Truth is I like doing these things, and I don't want to stop. I'm bonded to you and what you are. I mean, it's how you first found me. I don't know who I am if I'm not you. No consequences. No pain. No sorrow. I want that back. I want it back. I don't want to feel now what I didn't feel then. Where are you? Where are you? Help me. Help me. Nick lived in Pike Creek, Delaware, and was married to a woman named Sarah. Together, they had a son named Teddy. One night, Sarah and the baby were murdered by the demon Abraxas as they slept while Nick was out, drinking at the Elk's Lodge. After their deaths the grief-stricken Nick still resided in the house, and kept some objects that were connected to Sarah and his son. Lucifer chooses to use Nick as a so-called "Plan B" vessel when Sam refused to consent to him. However, because he isn't the "true" vessel, over time Nick’s body slowly became more and more degraded. The longer he continued to be occupied by Lucifer the more his body burned out, due to his meatsuit's inability to contain Lucifer's essence. Castiel tells Sam that Nick would be drinking gallons of demon blood in order to continue to host Lucifer. Nick is dispossessed when Lucifer gains consent from Sam, his body left behind in a apartment in Detroit. Despite no longer using Nick as a vessel, Nick appeared to be Lucifer's favored form to manifest visually in. Additionally, when Lucifer was expelled from Castiel by the Darkness, an image of Nick briefly overlaid Castiel. Several years after Lucifer first possessed Nick, his body was found by Crowley's demons, where it was repaired, improved, and warded so that Nick's body could be a suitable permanent vessel and prison for Lucifer. Following Lucifer's defeat, he was returned to Nick's unconscious body when Crowley altered Rowena's spell, causing Nick to once more become Lucifer's vessel. Nick remained Lucifer's permanent vessel for the next year and a half until Dean killed Lucifer with an archangel blade while powered and possessed by the Apocalypse World version of Michael. When Nick survived Lucifer's death, Sam theorized it was because the archangel blade was designed to kill the possessing archangel while leaving the vessel unharmed. Nick takes up residence in a makeshift bedroom in the dungeon of the Bunker to recuperate from his ordeal. His subsequent aggressiveness and Lucifer-like mannerisms when angered caused Castiel to believe that Lucifer did more damage to Nick's psyche than had been previously realized. After learning that nothing had been done in the decade since his wife and son's murders, Nick becomes determined to find the truth about happened to his family, going as far as becoming a budding serial killer. He targets people with special knowledge of the murders such as his former neighbor Arty Nielson, a local priest, and Frank Kellogg. Nick also gets the urge to kill innocent people, developing quite a taste for the act. He eventually discovers that the demon Abraxas, whom Lucifer knew personally, possessed Kellogg that night and used his meatsuit to kill Nick's family with a hammer. After getting his revenge upon Abraxas, Nick escaped police custody and began a search for Lucifer. Working with demons, Nick contacted Lucifer in the Empty and learned of a way to resurrect him. Using Jack's blood, Nick succeeded in bringing Lucifer back from the Empty, but was foiled by Jack, who killed Nick to stop him from trying again. Lucifer takes the form of Nick's deceased wife, to convince him into becoming his vessel. "If I help you...can you bring back my family?" Nick's wife and child have been murdered during a home invasion. As he grieves, he starts hallucinating. Lucifer appears as his wife Sarah and tells him that he is a vessel, and that Lucifer wants his consent to possess him. Lucifer says he is misunderstood, that he was punished for "loving God too much." He says that he will help Nick get justice for his family. Nick assents to possession. While talking to Sam about him being his true vessel, Lucifer told him that Nick was an improvisation or a "Plan B" and can barely hold him for long without spontaneously combusting. Castiel notices that Nick's body is beginning to deteriorate, with Lucifer telling him that his vessel is "wearing a bit thin" and cannot hold him forever, increasing his need to gain consent for possession by Sam. Nick is briefly mentioned by Anna who says that he's "burning away as we speak" while meeting with Castiel in the warehouse. Castiel tells Sam that he would have to drink an enormous amount of demon blood before he could let Lucifer inside him when they were discussing Sam's plan on imprisoning him along with himself. All the while, mentioning that Lucifer is drinking gallons as they speak so Nick's body can continue to contain him as it can strengthen the vessel. Dean and Sam meet up with Lucifer at an abandoned apartment in Detroit, Michigan where Nick's body appears to be more run down than their last encounter. When Sam agrees to be Lucifer's vessel, Nick's body is seen motionless on the ground after the dispossession. A comatose Nick about to be re-possessed by Lucifer. A few years after Lucifer abandoned Nick's body as a vessel, Crowley and his demons find him and have his body repaired and improved to act as a suitable permanent vessel for Lucifer. 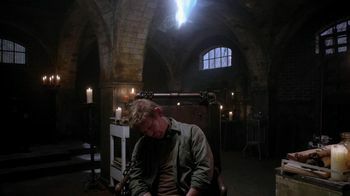 After Crowley corrupts Rowena's spell to send Lucifer back to the Cage, he is instead sent into Nick's unconscious body where Lucifer is restrained with chains. Due to Crowley's improvements upon Nick's body, he shows no signs of degrading from the possession like he did previously or like Lucifer's other vessels aside from Castiel and President Jefferson Rooney. Crowley revealed that he not only improved Nick's body to act as a permanent vessel for Lucifer, he also had the runes and spell-work from the Cage carved into every molecule in order for Crowley to effectively torture him as well as rendering him powerless and preventing him from vacating his vessel. After inspecting the surveillance photos Sam had taken from Dr. Hess from the British Men of Letters, Sam confirms to Dean and Mary that Lucifer is back and that he returned to his old vessel. After granting consent to Michael for possession, Dean is able to kill Lucifer with the archangel blade. Nick's body is left lying on the ground with Lucifer's wings singed around him. "It must be weird, you looking at me and seeing him." While Sam is talking with Jack, Mary interrupts and tells Sam that "he's awake." Sam enters the Bunker's dungeon, where Nick, still alive after Lucifer was killed, is sitting on his bed. Sam cleans the wound Nick sustained when Dean stabbed Lucifer with the archangel blade. As Sam dabs some hydrogen peroxide on the wound, Nick questions why he is still alive, leading to Sam theorizing that when an archangel blade is used to kill an archangel, the vessel is somehow spared. Nick feels guilty for giving Lucifer his consent to possess him and acknowledges that it's weird how Sam can still see Lucifer when he looks at him. Despite that, Sam and Nick are both glad that Lucifer is dead. When Sam asks what Nick remembers, Nick says that he only remembers bits and pieces from when he was possessed. He tells Sam that while he doesn't remember much about Dean, he remembers something about Michael's plans: how he said "he wanted to do it right this time." "That was no man. That’s not man. That’s a monster. It’s a monster, and then Lucifer found me and made me a monster, too. Oh my God!" Nick continues to struggle with having been Lucifer's vessel. He questions Castiel as to why he would do something like that, forcing Castiel to remind him that his family was murdered, causing Nick to have an emotional breakdown as the memories come flooding back to him. Nick involuntarily snaps his fingers at Castiel as if he was Lucifer. Later, Nick enters the Bunker library with a laptop and informs Castiel that nothing has been done about the death of his family, revealing there have been no mentions of them past the year of their deaths. Nick begins blaming himself and calling himself a coward, telling Castiel how he would have been on the police to solve the case every day, but that his grief led him to being possessed by Lucifer. As Castiel tries to comfort Nick, he reacts to Castiel touching his shoulder by saying "don't" and snapping his fingers, much like Lucifer has done in the past. When Castiel asks why he did that, Nick appears confused as to what Castiel is talking about. Believing some residual influence from Lucifer remains in Nick, Castiel touches Nick's shoulder to sense his mind, coming to the conclusion that Lucifer may have inflicted more damage on Nick's psyche than they could have imagined. Nick storms out of the library, telling Castiel he is going to find out who killed his family. When Castiel asks what he will do when he does, Nick does not answer him and walks away. Nick attempts to speak with a police detective about his family's case, but only meets with indifference. He reveals to Castiel that there was a witness who at first claimed to have seen a man leaving his home but later changed his story. When Castiel tries to get Nick to see that he has been given another chance, he tells him about Jimmy Novak and his death as his vessel. In response, Nick compares Castiel to Lucifer, calling him a "stone-cold body snatcher." This visibly shakes Castiel and he leaves Nick alone, telling him that what happened to Jimmy and his family was and still is his greatest regret. Nick travels to Pike Creek, Delaware, where he meets with his old neighbor, Arty Nielson. Arty had initially given a statement that he saw a man leave Nick's home the night of the murders, but later recanted. Nick begins questioning why he would have done that, and begins asking if he saw a man with a hammer, recounting how his family died. Arty continues denying that he saw any man and only said what he did in hopes of helping Nick. Nick, however, becomes more agitated at Arty, and violently pushes him into a wall telling him he and his family deserve justice. Sometime later, Nick bludgeons Arty to death with a hammer, placing the bloody weapon on an end table before leaving. Sam questions Castiel about Nick, who informs him that Nick left, leaving a note explaining he had "personal business to attend to." Castiel says that his calls to Nick have gone unanswered, and that he assumes Nick needs some time due to being in such a "dark place". "You were possessed. Yeah, this -- this -- all this, it's not your fault. But this was the hand that murdered my family. And even if it wasn't you, it was still you. I can't let that slide." Nick sits in an office talking of the hate he feels for himself for enjoying the violent things he does. He accepts that the priest couldn't reveal what Arty told him in confession, but tells the dead priest that he should have helped him find his family's killer, telling the dead and crucified priest he will look into his suggestion of prayer before leaving. Nick then meets with a reporter from Pike Creek, Diane Fargo, who reported on his wife and son's murder. She tells Nick that there was nothing to go on, even her own theory that he did it wouldn't hold water due to his being drunk at the Elk's Lodge on the night of the murder. She does give him the name of the police officer that worked his street that night, Frank Kellogg, telling him he currently works private security in Montauk. As Nick travels to find Frank, he waits in his car in alley when he sees a woman exit a club. He contemplates whether to leave the car or stay. Choosing to exit he approaches the women, who invites him to join her and her friends in the club. Nick however has to fight the impulse he has to kill the women and yells at her to leave as he takes control of his violent urges. Arriving in Montauk, Nick locates Frank Kellogg's home. When he shows up on his doorstep and reminds him of his family, a panicked Frank attempts to close the door on Nick only for Nick to rush in and restrain him. After torturing Frank for information, Frank finally tells Nick that on the night of his family's murder, Nick’s wife called the police because she heard what she thought was a prowler outside their home. When he arrived, he encountered a man named Abraxas and blacked out, only to find himself in his car covered in blood. Nick realizes that Abraxas is a demon that Lucifer knew and that Frank was possessed when he committed the murders. When the police found out, they covered up the murders and extorted Arty to change his story. Despite the realization that Frank was not in control and therefore not to blame, Nick is unable to ignore the fact that Frank's hands were still the ones that murdered his family; Nick bludgeons Frank to death with a hammer. After brutally murdering Frank, Nick kneels in prayer and begins admitting he likes killing people and doesn't want to stop. He enjoyed being Lucifer’s vessel and doesn't want to feel pain or sorrow or consequences any more. As he prays to the dead archangel, Lucifer somehow hears Nick and awakens in the Empty. "I needed the truth, Sam. I needed revenge for my family. You would’ve done the same thing." Nick captures a demon who had been working with Abraxas before Abraxas was captured by a hunter. Having been led to the demon by a previous demon he had killed, Nick holds her within a devil's trap and tortures her using an angel blade that he took from the Bunker when he left. The demon offers to freely tell Nick what she knows about the hunter who is in Hibbing, Minnesota, having no reason to protect her, but Nick tortures the demon anyway, going so far as to take out her right eye with his angel blade. The demon identifies Mary Winchester as the hunter in question whom she had witnessed trap Abraxas in a box. Once the demon tells him all she knows, Nick kills her. Nick gets his revenge on Abraxas. Now knowing where to look, Nick travels to Hibbing, where he stops at a grocery store for directions, unknowingly just missing Mary. Nick draws the clerk's suspicions, particularly with his aggressive questions, causing the clerk to lie to him and then call Sheriff Donna Hanscum to report the encounter once Nick is gone. That night, Nick is pulled over by Donna and handcuffed, Donna having discovered that he is driving a van reported stolen two weeks earlier in Missoula, Montana. Nick refuses to cooperate with Donna, who uses a mobile fingerprint scanner to run Nick's fingerprints in an effort to learn his true identity. As Donna is distracted running his fingerprints, Nick picks the lock on his handcuffs. From Nick's fingerprints, Donna learns of his identity and his being wanted for a murder spree, but Nick is able to subdue Donna with her taser. Nick learns of Mary's location at Donna's cabin from emails on Donna's cell phone and leaves the sheriff unconscious but otherwise unharmed in the driver's seat of her patrol car. At Donna's cabin, Nick kidnaps a surprised Mary and explains how he is looking for Abraxas, who murdered his family the same way he murdered the Girl Scout troop that Tonya Baker, whom Mary had rescued, belonged to. Mary tells Nick that she killed Abraxas, but he reveals that he knows she's lying as the demon that had escaped her witnessed Mary trapping Abraxas. Mary finally admits that she couldn't defeat Abraxas so she instead locked him in an Enochian puzzle box. Mary reluctantly agrees to lead Nick to her lock-up in Grand Rapids, Michigan, where the puzzle box is stored, but she forces Nick to search through the lockers himself without telling him which one contains the box. After finding it, Mary reminds Nick that Abraxas will need a meatsuit that can't be either of them, so Nick kidnaps the security guard at the facility, Jeff. With Mary uncooperative, Nick tries to figure out how to open the puzzle box on his own, finally resorting to drilling into it which releases Abraxas in his smoke form and forces the demon, stuck within a devil's trap, to take Jeff as his meatsuit. After Abraxas takes possession of Jeff, Nick demands answers from the demon, who doesn't realize who Nick is until Nick tells him that he is from Pike Creek, Delaware. Abraxas proves to be amused by Nick's questioning, the fact that Nick is no longer possessed by Lucifer, and that Lucifer is dead. Abraxas, holding a grudge of his own for Mary's trapping him, offers Nick answers if he kills Mary slow and bloody. As Nick moves to do so, he is interrupted by the Winchesters, who'd tracked Nick through his stolen van with Donna's help. Desperate to get answers, Nick uses his angel blade to break the devil's trap, releasing Abraxas, who immediately slams everyone to the floor with telekinesis. Turning to a shocked Nick, Abraxas reveals that he murdered Nick's family on Lucifer's orders and explains that Nick was chosen, but he was not special claiming they "threw a dart at the phone book" to choose who to target. As Dean begins an exorcism that Abraxas stops, Nick takes advantage of the distraction, shoves Abraxas to his knees from behind, and stabs the demon in the chest with his angel blade, killing Abraxas and finally avenging his family's deaths. With Abraxas dead, the Winchesters surround Nick, who tries to strike at Mary with his angel blade. However, Donna shoots Nick in the leg, allowing Mary to knock him unconscious. In the aftermath, Nick is arrested for his murder spree by Donna. When confronted by Sam before Donna takes him away, Nick is unrepentant, believing that he did what he had to do to get revenge for his family and that Sam would've done the same thing. Nick tells Sam that Sam couldn't help him as he isn't broken, but Sam feels that Nick is wrong about that. Sam tells Nick that he doesn't feel sorry for Nick but for Nick's victims who will haunt Nick for the rest of his life and that Nick can burn. Nick detained in a hospital. After being arrested, Nick is held in a hospital to heal from his gunshot wound to the leg. While there, he learns from the guarding police officer that he is wanted in four different jurisdictions. Nick claims that he was possessed by Satan, but is dismissed by the officer, who leaves to eat his meal. As Nick sits in his bed praying to Lucifer, he is interrupted by the officer. Nick asks to be uncuffed to use the bathroom, asking for some dignity, which the officer reluctantly agrees to. Once uncuffed, Nick takes a bed pan and knocks the officer to the floor and proceeds to repeatedly stomp and kick his head until he is a bloody unconscious mess. Nick picks up the keys to his cuffs and unlocks them, grabs his bag of clothes, and limps out of the room. After breaking in to his home in Pike Creek, Nick starts to feel a chill and sees a mirror in the room frost over. Doors start to bang loudly and rapidly behind him. As the light starts to flicker, his wife Sarah appears before him. At first he believes this to be Lucifer before Sarah tells him she is his wife. Confused as to why she is a ghost, Sarah tells him she has unfinished business involving her family's deaths. Nick tearfully tells her he got revenge for her and Teddy's deaths and she can move on. He also explains how she and Teddy were killed by the demon Abraxas, who possessed Frank Kellogg. She tells him how she was there the night he chose to be with Lucifer, and her unfinished business also involves Nick needing to reject Lucifer. When Nick can't bring himself to do so, Sarah tells him he has doomed her to be stuck in their home forever and has doomed himself. As Nick is about to leave the room, Sarah asks where he is going. With tears in his eyes, he tells his wife "Wherever it’s darkest. Wherever he is." as he wanders around their old home. "He loved you. You know that? He did. I felt it. He loved you so much and you broke his heart. Of course, I'm talking about the old you. The "you" with the soul. Yeah. Kermit the Prophet told me about your sitch. What's it like not having a soul? Must be relaxing." Looking for Jack, the Winchesters return to the cabin, where they find Nick's body and are horrified at what Jack did to him. Sam covers Nick's body with a blanket, but it is apparently otherwise left untouched at the cabin. The name "Nick" is possibly a reference to "Old Nick" which is a nickname for the Devil. Nick's status was unclear following Lucifer's return to his body in 12.13 Family Feud -- whether he remained alive after his first possession by Lucifer, had been resurrected to act as a vessel again, or whether or he was like Jimmy Novak: a dead vessel restored to act as a permanent vessel for their possessing angel. 14.01 Stranger in a Strange Land confirms Nick was either still alive or was resurrected by Crowley. Nick being alive at the time of 12.13 Family Feud makes it unclear how Lucifer was able to repossess him as it has been previously established that when an angel leaves their vessel, they need permission once again to reenter. 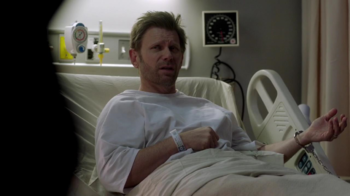 At the time Lucifer reentered Nick, he was unconscious in a chair and did not appear to have consented. However, he may have been in a vegetative state, much like how Donnie Finnerman was shown to be catatonic in 5.03 Free to Be You and Me. Angels also do not require verbal consent, as Gadreel was able to possess Sam through his subconscious. Another possible explanation is that when Lucifer left Nick's body, he left the door open a crack in his mind so that he could return at will as Michael did with Dean as seen in 14.09 The Spear. Mark Pellegrino's name did not appear in the opening credits for 14.01 Stranger in a Strange Land, presumably to maintain the surprise of Nick's return. However, during the airing of the episode and before Nick appeared in person, a promo for the movie Halloween was aired featuring Sam asking Nick about Michael, thus ruining the surprise. 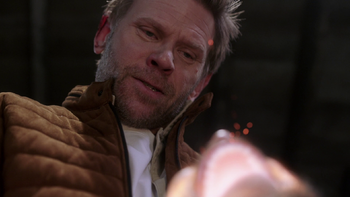 Mark Pellegrino returned to the opening credits for 14.02 Gods and Monsters for his role as Nick. The same thing happened with Mark's surprise appearance as Lucifer at the end of 12.12 Stuck in the Middle (With You) with Mark then appearing in the opening credits for the very first time as a main cast member as Lucifer in the next episode 12.13 Family Feud. 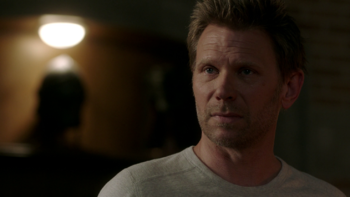 Nick is the second main character portrayed by Mark Pellegrino, a role which he took on after Lucifer's death. With Nick's arrest at the end of 14.11 Damaged Goods, the death toll during his pursuit for revenge comes to five people and at least three demons, with Nick mentioning to the demon at the beginning of the episode that he had killed at least one more off-screen that led him to her. If either of those two unnamed demons' meatsuits were still alive, he would've killed them as well. In addition to murder, Nick's crimes included kidnapping, torture, breaking and entering, grand theft auto, resisting arrest, assaulting a police officer, and possibly attempted murder for attacking Mary Winchester on Abraxas's orders before Sam and Dean intervened. During the scenes where he commits his murders, Nick takes no visible precautions to stop himself from leaving fingerprints, even leaving the hammer which he has touched with his bare hand behind at Arty Nielson's crime scene, which explains why his fingerprints could be used to identify him as the killer. The fact that they specifically identified Nick by name when Donna ran them suggests that Nick has some kind of criminal history that resulted in his fingerprints being on file, otherwise there would've been no reason for Donna to get a specific match on him. In 14.12 Prophet and Loss, its revealed that at least four different jurisdictions want to prosecute Nick for his crime spree. These presumably include Pike Creek, Delaware; Montauk, New York; and Grand Rapids, Michigan. Hibbing, Minnesota, may be another one, but Nick's crimes there only amounted to resisting arrest and assaulting a police officer. Another possibility is the location where Nick killed the demon that led him to Mary Winchester at the beginning of 14.11 Damaged Goods. In 14.12 Prophet and Loss, his full name can be seen on his hospital bracelet: Vaught, Nick. Nick Vaught is the name of a former PA and current writer's assistant and writer on Supernatural. It has not been confirmed that this is Nick's real surname. This page was last edited on 12 April 2019, at 12:55.